Just a very small addition, now if we set wallpaper.png file in the directory the exe is at, it will show that as background(can also be one solid color), also some small fixes. i always get danger warnings when downloadoing this,are you sure its vírus free? I can't do much about that, these are safeguards that are easy to skip for big corporations, but difficult for people that are doing this for free on their own. The way it is made it only connects to the net if you click link that says "Online" and that will only open a webpage in your default browser.Only changes it makes to your hard disk are the .txt files it doesn't even create temporal files. I can't make it safer then that, but digital signature and stuff like that are expensive I think, not even sure I can get one without having a company. However there is a good news here. There are ways to be able to use and run app, without allowing it to change anything in your pc. I will explain 2 ways that can work for anyone to use any app that is otherwise worrisome(be that coz it doesn't have signature or other similar reasons). First way is apps like Sandboxie. Sandboxie is a sort of virtualization, it allows us to run apps that are run in their own space, without any way for them to interact with our system. Even more useful for stuff like Five Arts apps, as in there we can just see the result without saving any changes. Now, lets say we are really, really worried about app. So worried that we don't want it to run on our machine at all(as there are viruses that can mess up hardware, so sometimes that can be reasonable concern). But we still want to see what it does. For that we need a lot more effort, however once we have it running we can run any app on it without worry. We need full virtualization this time, not only files in safe space, but actual virtual hardware. It is something like what sandboxie does, but this time a whole system is emulated and run in that space. For that we can use software like Oracles VirtualBox. This allows us to install virtual machine with its own virtual hardware. If there is virus, nothing can get to our system. Oracles VirtualBox is also fully free. Now, I'm not saying we should run apps we think may be dangerous. But in todays world there is so much level of protection,warnings and safeguards on any software uploaded in the net, that very often small developers(even more so in apps made for free without a company related to them) will have a lot of issues going over all of that. So in short - there isn't much I can do about that at this point. There are ways to be more comfortable using the apps, but it is free software after all and I can't afford the stuff it will need to get it looking fully like professional one. These key pairs are FREE if we self generated. But they sell them for triple digits USD. This is madness and outright crime. Any antivirus software will always issue a warning if you run a file with the .exe extension. But if you scan Gmuli's software with AVG (free antivirus), it will say it is safe. I have not had any problems with Gmuli's software. 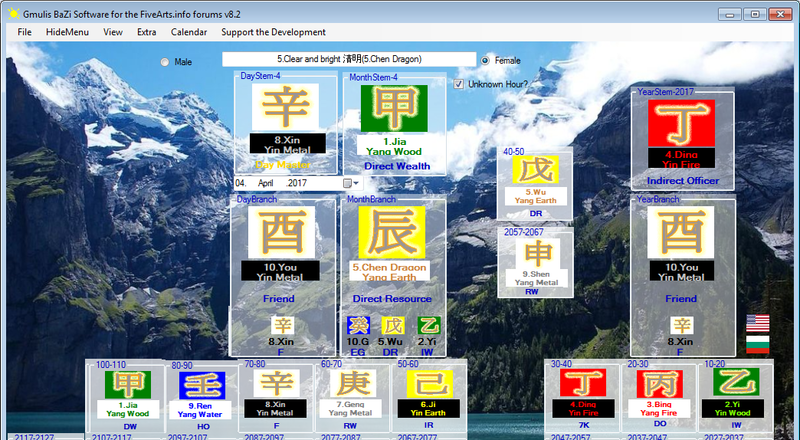 I have downloaded two - the Bazi calculator and the Wen Wang Gua Calculator. One who wishes to hack into your system will not identify himself. Gmuli is well identified here, and the Administrator has his identity info. So it should not be a cause for concern to download software from one who shares freely. Hey, I think Gmuli deserves a monument and not distrustful notes. I have been in Five Arts' communities 30+ years and I have rarely seen a person so dedicated to distribute real and preciouis knowledge. Though unlike him, I am convinced everything must be 1)earned by hard labour and commitment and 2)paid, even symbolically. If you give the hungry one a fish instead of a fishing rod, he will most probably not find it satisfactory (I mean,the fish. And the approach,too). Of course, a little common knowledge on IT protection will not harm anyone. If someone is really worried we can test how the app interacts(what changes it can make in the system etc. ),but it should be the same as what is described above. As the apps become more, it seems fair to have some bibliography/mention of sources. Will start with the BaZi app. In the future may move it to the app in Help>About. Along with some other websites I can't find currently. The rest is general knowledge and can be found in multiple sources.Tell me if I missed something. Members have mentioned that the calculator is starting to get cluttered. So instead of making different views with different things showing, there are some new functions added. One is Year > Hour from left to right, as most mang pai translations follow this. The other is File > View > Designer. Designer is a mode of working of the app where you can move freely any element on it, including the date/hour selector. In that way if you don't want to see specific text you can just move it out of view. If oyu want other places of some of the controls that is easy to do as well. Example here of how it looks with branches moved on top of the extra info below(solid pillars etc), most of the controls dragged out of the screen, also one of the luck pillars pulled up for easier work with it. Go in View and click Designer. It gets a checked sign next to it meaning its active. Now every control can move around with drag and drop. Do all changes you want to do. Can move elements out of screen, set on top of each other or anything else you can think of. Some of them won't move alone, for example Year Stem image won't move by itself it will move with the Year Stem group - that is, so it doesn't become more messy then needed. As soon as you are done you go View>Designer again and when you click to disable it it will make a file called "options.txt" where all new controls and positions will be saved. That is helpful for 2 reasons. First you can always delete it to go back to the default way. Second it means everytime the app starts it will look in the way you made it. Right now resizing the window will work in a different way then usual, allowing to make the whole app more compact, but it isn't saved. As soon as designer is turned off it goes back to old mode of resizing. P.S. It isn't up yet, new version will be in the link in a few days so I can be sure it all works ok. Won't post another post, just check in 3-4 days should be there if all is fine. Page created in 0.372 seconds with 58 queries.